Daddy Issues release date was Friday, April 19, 2019. This was a Limited in theaters release. 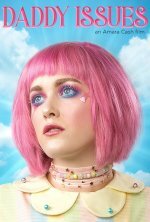 Follows Maya, a 19-year-old queer artist, who escapes into her candy colored world of drawing emo cartoons and cyber-stalking her insta-crush Jasmine, a sexually fluid fashion designer. One night Maya meets Jasmine IRL. Sparks fly and the two begin a romance that gives Maya her first taste of true love and Jasmine the inspiration to jumpstart her career. It’s all gumdrops and fairytales until Maya discovers Jasmine’s in an unconventional relationship with Simon, a doctor moonlighting as a sugar daddy.